Sharing an apartment can be difficult for both you and your cat. You might feel suffocated by your cat’s litter box and other not-so-stylish cat products and your cat might feel limited by a small space and not enough room to roam. We believe that even cats who live in tiny homes can experience a species-appropriate, instinct-satisfying life. Make your cat’s litter box virtually disappear. 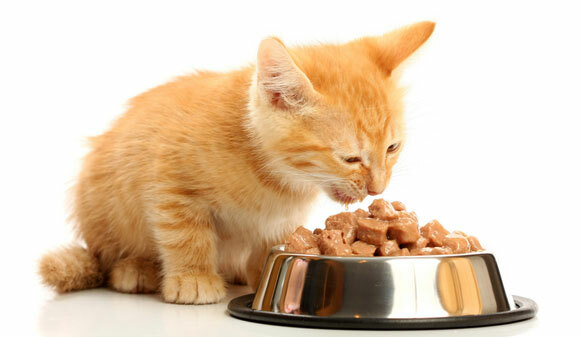 “Catify” your house so that it’s an instinct-nourishing playground for your cat. Give your cat vertical space without getting a cat tree. Create a safe outdoor space even though you don’t have a large yard. 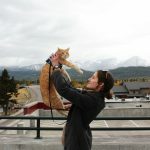 There are many ways to expand your apartment and multiply the amount of space your cat has to roam—without breaking down any walls and combining your apartment with the neighbors’. 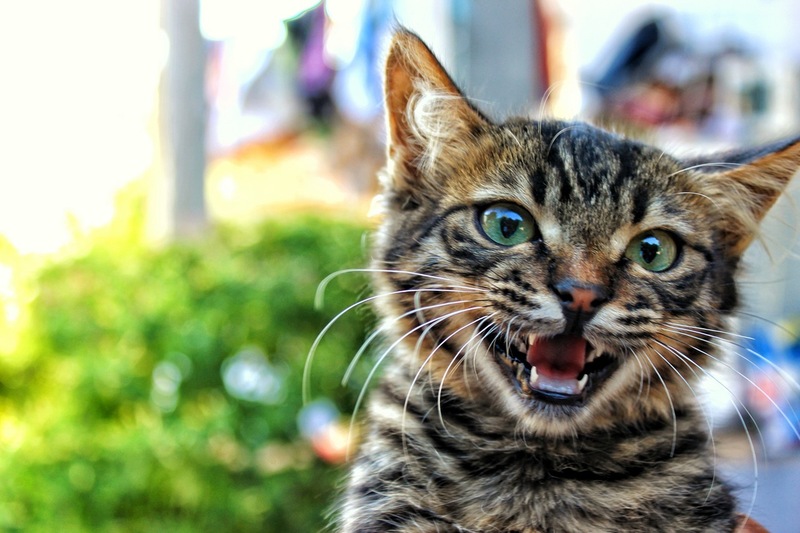 The following tips will help you to make your apartment more fun for both you and your cat. 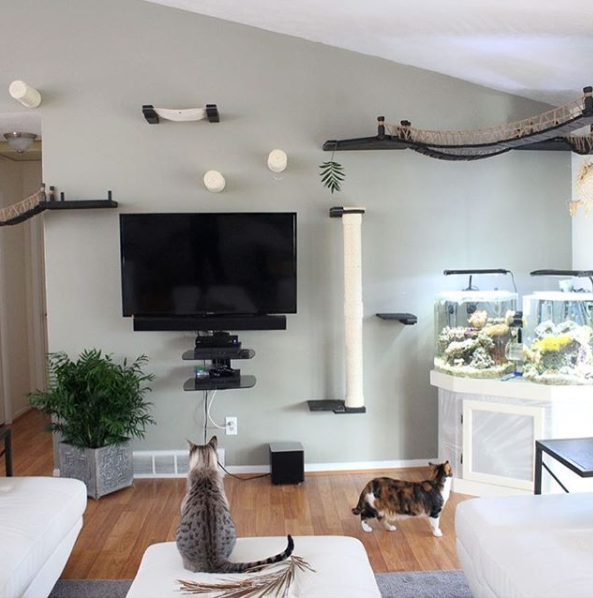 Satisfy your cat’s climbing instincts by providing vertical space. Many cats love to climb—high places give them confidence and provide an excellent base for watching the activities of the home. One of the best things about vertical space is that it can add a lot of area for your cat to roam but won’t take up much space in your home. There are so many ways to increase the vertical space in your house. Traditionally, you might choose to get a cat tree, but cat trees take up a lot of precious space and might not fit your decor scheme. For a small apartment, we prefer wall shelves. Some people even use a system of cat shelves to make a house-spanning walkway. This allows your cat to traverse the entire home without ever placing their paws on the floor. 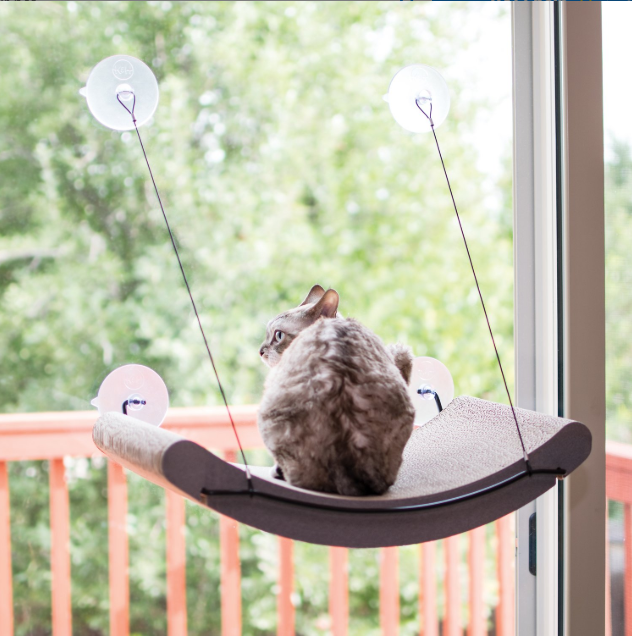 In addition to traditional cat shelves, you can install cat hammocks, shelves, and scratching posts. When space is limited, make everything serve multiple purposes. Your cat’s wall shelves can double as bookshelves or decorative cubbies for flowers and fruit. Remember, not every cat takes to vertical spaces. Wessie feels more comfortable staying close to the ground while Forest scares us by climbing high up in trees and balancing on railings. Keep your cat’s preferences in mind while “catifying” your apartment. Shop for cat shelves on Amazon. 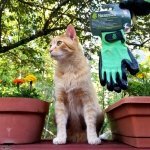 Create a catio to give your cat a safe way to enjoy the outdoors. Though you likely don’t have a lot of acreage on which your cat can roam and play, you may be able to buy or create a catio with whatever limited space you have. If you have a balcony, make the most out of it. By creating a protective barrier and finishing the floor with a cat-friendly surface, you can create a spacious catio for stretching, lounging, and catching bugs. 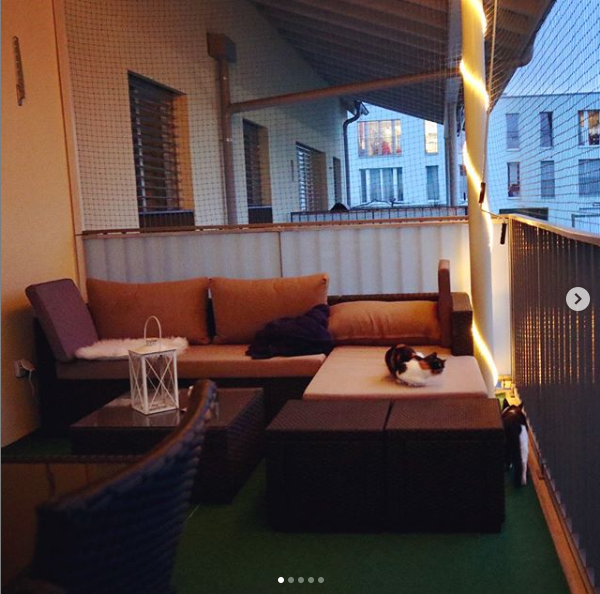 We’re inspired by @swissadventurecats’ kitty balcony, which features a turf floor and a floor-to-roof fence that keeps the kitties safe. Make places for your cat to hide. Remember that your cat is a small, vulnerable animal—it’s emotionally nourishing and comforting for t hem to have a place to hide. 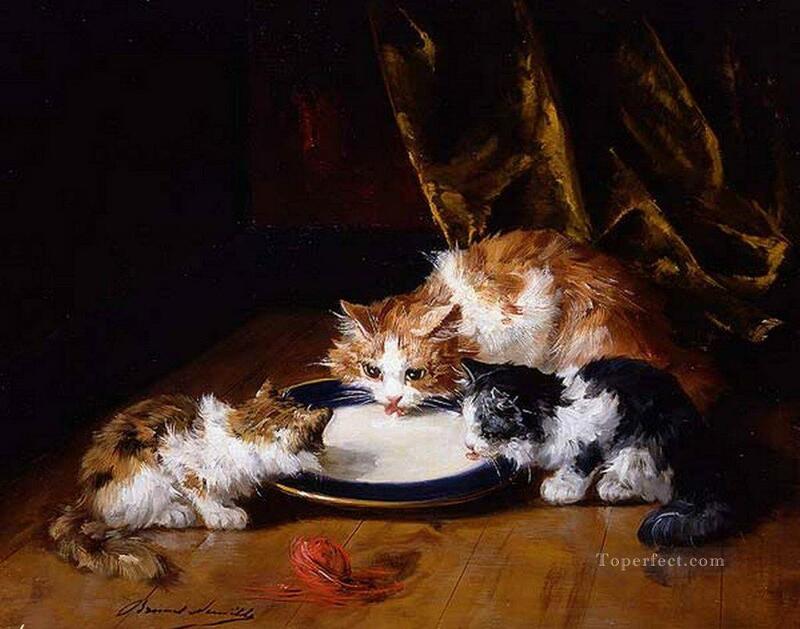 Especially in multiple cat homes, it’s important for each cat to have a private place of their own where they can sit and just be themselves. This place must be completely quiet, safe, and secluded. No probing hands or other cats allowed! For cats who live in small apartments, a dark, cozy hiding place may be hard to find. If your house doesn’t have any small cubbies or coves, create one! Install a cat door on a closet or cut a hole in a cardboard box filled with blankets. You might also buy a cat tunnel, which is a place to play and hide. Cats who live in apartments have just enough room to chase their tail—they don’t have stairs to race up and down or a large living room to run across. To compensate for this lack of exercise space, use toys and ingenuity to give your cat concentrated bursts of high-intensity exercise. A playtime session once in the morning and once at night will control your cat’s (sometimes destructive) energy levels and help to keep their muscles strong. 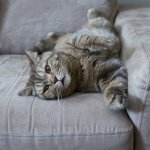 How to Make Your Apartment Cat Friendly – For You! Choose a really, really good cat litter to keep smell down—and consider litter box deodorizers to help. To keep cat litter box smells from overtaking your apartment, choose a litter that’s good at controlling odor. In our experience, firm-clumping clay litter is the most effective type. 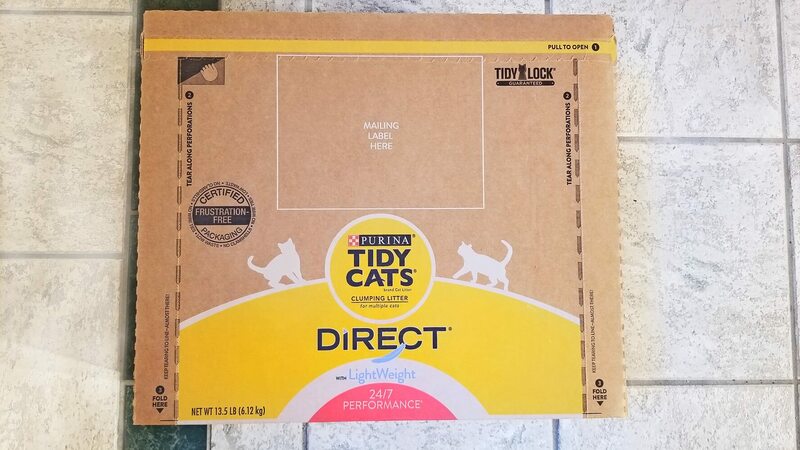 Tidy Cats and Dr. Elsey’s are both good options that offer excellent clumping, good odor control, and won’t break the bank. Pine pellets can also be a good choice, but remember that they tend to track quite a bit. If you want to give your cat’s litter box a little extra odor control power, use litter deodorizing granules like these sold by NonScents or use a deodorizing spray like Live Pee Free. A few spritzes of Live Pee Free are an easy solution for a poorly-performing litter or a box that tends to retain odors despite regular cleaning. 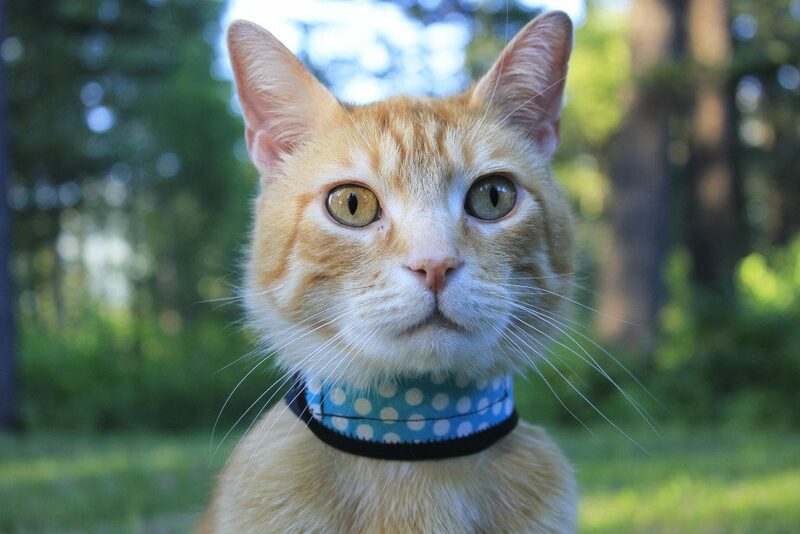 It’s also helpful if your cat urinates outside of the litter box for some reason—read our review of Live Pee Free here. Use litter box enclosures that double as storage containers. Storage, storage, storage! Storage containers are the the apartment dweller’s secret to keeping their stuff from overtaking the house. By popping your cat’s litter box into one half of a storage bench or closet and using the other half to store your cat’s supplies, you maximize your space and minimize the appearance of a cat litter box in your home. The web is full of tutorials on how to make your own litter box enclosures. 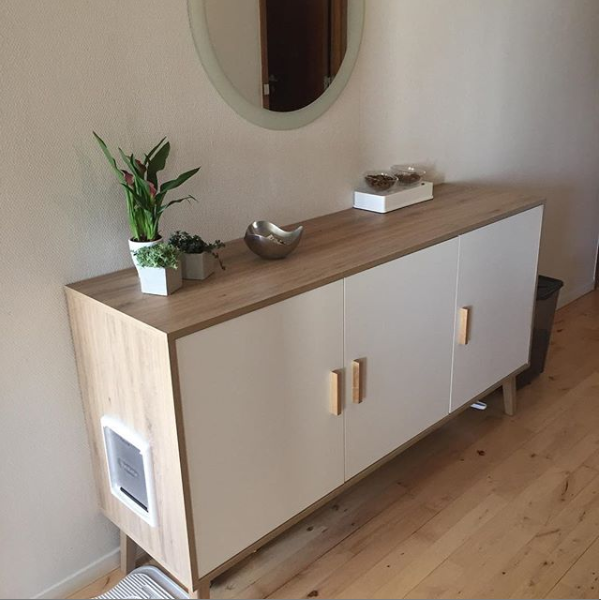 Many of them are interesting modifications of simple Ikea items and other simple cabinets. If you’re not into the DIY thing, you can also buy a premade litter box enclosure on Amazon or Chewy. While some of these enclosures are for litter only, others double as end tables, benches, or small storage containers. Whatever you choose, remember that an enclosure isn’t an excuse to ignore your cat’s litter. What’s out of sight may be out of your mind, but for your cat, a litter box enclosure can quickly turn into the litter box equivalent of a porta potty at a summertime concert. So get into that enclosure and clean out your cat’s litter box! 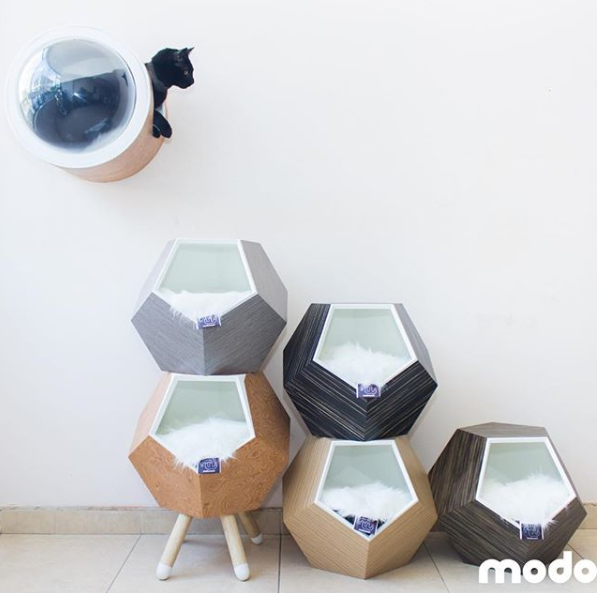 Choose beds and scratching posts that multitask as stylish accents. First of all, your cat needs a scratching post. Without one, your cat will have nothing to use but upholstery, rugs, carpet, or even hardwood floors. That said, there are a few ways you can make your cat’s scratching posts demand less space. Try wall-mounted scratching posts. These attach to the wall, so you don’t have to worry about a wide base taking up space. Or you can choose a cat tree, hammock, bed, or cat shelf that incorporates scratching pads or posts. This kitty window cradle is made out of scratchable cardboard, so it serves multiple purposes at once. 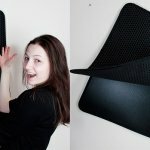 It expands your cat’s world by giving them a place to lounge while they look outside, is a nice little lounger, and it also serves as a scratching pad. While some apartment dwellers don’t mind filling their house with cat toys, brightly-colored beds, and other blatantly feline-specific items, others might feel that subtle, stylish pieces open up the home and make it look fresh. Shop Hauspanther, Chewy, and Amazon to find refined cat furniture that’s both comfortable and subtle. It IS possible for you and your cats to enjoy life together in a small apartment! A combination of home catification and choosing cat care items that work double time as storage units and decor can make your apartment a veritable kitty cat paradise. If you and your cats share a small apartment, what methods have you used to make your home cat-friendly? Share your ideas in the comments! Thanks for commenting! Cat furniture can be super expensive, but in our experience, you can almost always find economical alternatives either by making them yourself, upcycling other products, or buying used items. I’m not sure about the wall bridges, specifically, but I’m sure you could figure something out. 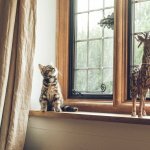 Are you a representative of Cat Tree UK? 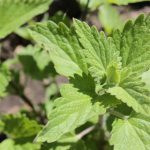 I took a look at the site and it looks like a good resource for UK shoppers looking for a place to buy cat trees and other items.